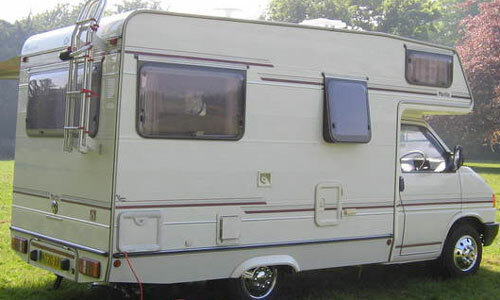 Circa 1995 Autohomes released a new coachbuilt model based on the VW T4 Long Wheel Based chassis cab platform called the VW T4 Autohomes Merlin Motorhome. 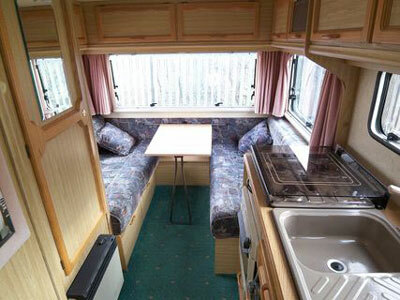 The interior had a “U” shaped lounge area at the rear that converts to a bed at night, a well fitted kitchen area in the middle and a shower area. Entry was via a side door. 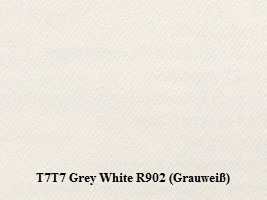 Note the Autohomes Merlin name had been used in earlier years for non VW models. No price list yet ! Do you have a copy that you could send me ? Please help out and send me a copy or contact me for postal details. Petrol Watercooled 2.0 Litre, 4 Cylinder, AAC Otto Motor (1968cc), 62 Kw 84 PS, 5 speed manual gearbox, wheelbase xxxx mm, £? Petrol Watercooled 2.5 Litre, 5 Cylinder, AAF Otto Motor (2461cc), 81 Kw 110 PS, 5 speed manual gearbox, wheelbase xxxx mm, £? Diesel Watercooled 1.9 Litre, 4 Cylinder, 1X (1896cc) 45 Kw 61 PS 5 speed manual gearbox, wheelbase xxxx mm, £? Diesel Watercooled 2.4 Litre, 5 Cylinder, AAB (2370cc) 57 Kw 78 PS 5 speed manual gearbox, wheelbase xxxx mm, £? 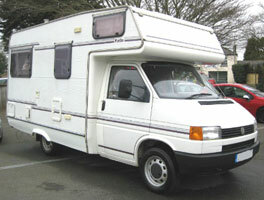 As far as I know the VW Autohomes Merlin was available in 1 colour. “U” Shaped lounge area with seating (storage under seat bases) that converts into double bed (2010 mm x 1350 mm) and removable table. 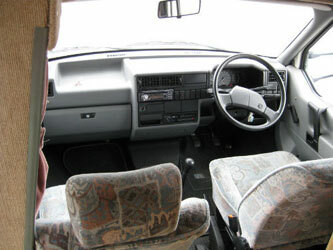 Fully adjustable captains cab seats upholstered in same material as rear seats. Seats had headrests. 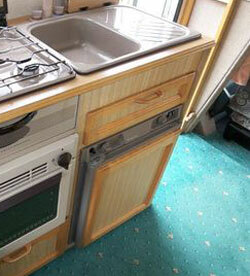 Sink and drainer has hot and cold water via mixer tap and cover to create additional work surface. 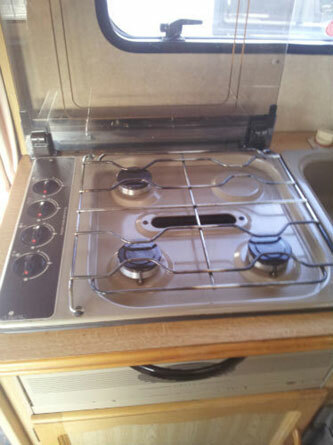 Spinflo three burner hob and grill. 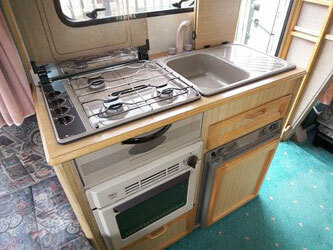 Thermostatically controlled Maxol Monte Carlo 3000 Oven with push button ignition. Electrolux RM4206 three way (gas / 12 volt / 240 volt operated) refrigerator (with electronic ignition system). 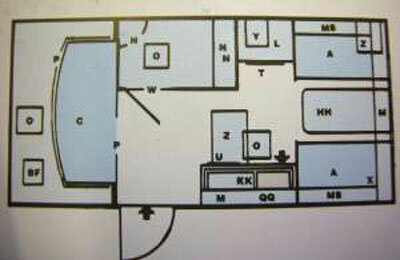 Fridge has internal freezer compartment. 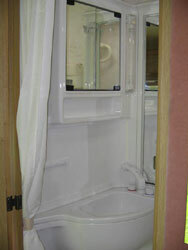 Wardrobe between shower unit and rear seat. Maxol Montana 1800C space heater at base of wardrobe. 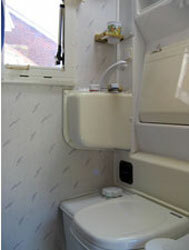 Shower cubicle (behind drivers seat) with Thetford electric flushing cassette toilet, hand basin, built in strip lighting. Opening roof lights for ventilation. Overhead lockers along both sides. 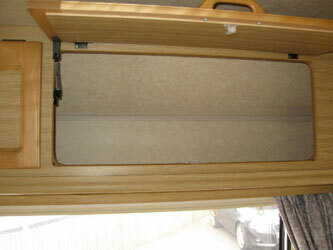 Exterior lockable compartment accessible from inside and outside the vehicle. Exterior access gas bottle cupboard holds two x 7 kg butane or two x 6 kg propane cylinders. Maxol Montana 1800C space heater. Carver Cascade 2GE water heater with mains hook up facility. 54 litre fresh water tank for pressurised water system with electrically pumped water tap via a self priming Shureflo water pump. 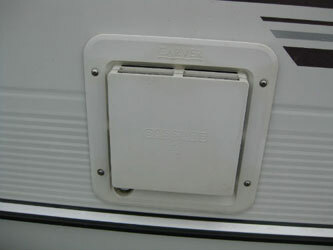 Externally locking filler cap. CEC 225 (Plug In Systems) 240 volt mains electric hook up with safety protection via RCCD circuit breaker and two MCB’s. 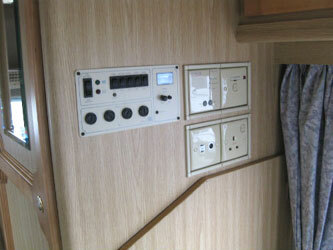 Zig electrical control panel with Zig X3 charger for leisure battery. Two x internal 240 volt mains outlet sockets. 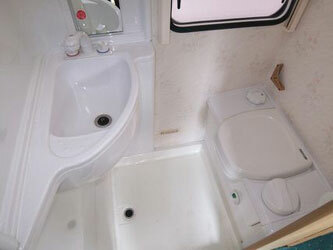 Two x twin-tube fluorescent units, single fluorescent over kitchen, twin bulb unit in overcab bed, single tube unit in washroom. 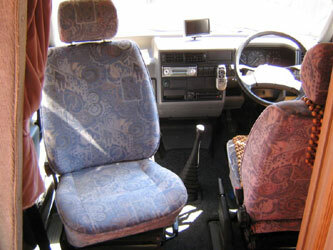 Head rests on both cab seats. Intermittent wipe and two speed wipers. 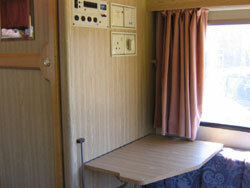 Double glazed windows with insulated roller blinds, fly screens and lined curtains. 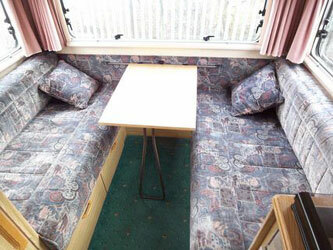 Specially selected seat fabrics with fire retardant foam. Power steering for 2.0 litre petrol model - it was already standard on other larger petrol and diesel models. Opening roof vents for fresh air. 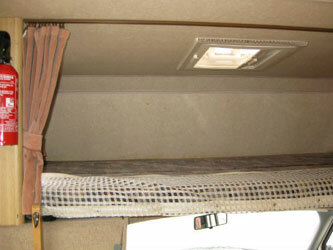 Overcab double bed (1960 mm x 1040 mm) with retainer net. 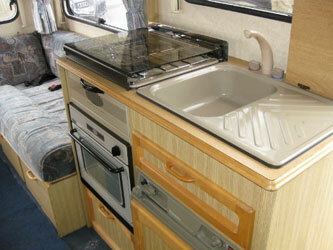 On the first the coachline stripes on the side and rear were blue and situated at the lower, mid and roof height. 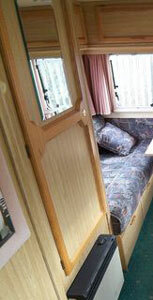 On the second the coachline stripes on the side front and rear were a brown and silver grey combination. There was a Merlin logo on each side below the side front roof height window. On the rear there where also blue or brown and silver grey stripes with the mid level one having a Merlin logo in the centre. The front of the roof also had blue or brown stripes. To receive notifications when this website is updated subscribe to my VW Camper Blog or Follow Us on Facebook..